Pic(k) of the Week: 42 years of Anchor's "Merry Christmas and Happy New Year." This is the forty-second annual "Our Special Ale" from the brewers at Anchor. It is sold only from early November to mid-January. The Ale's recipe is different every year, as is the tree on the label, but the intent with which we offer it remains the same: joy and celebration of the newness of life. Since ancient times, trees have symbolized the winter solstice when the earth, with its seasons, appears born anew. 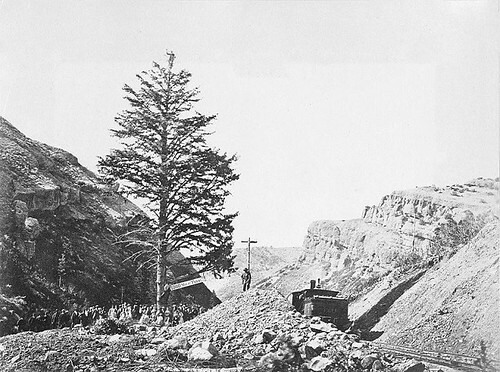 This lone pine was found 1,000 miles from Omaha during the westbound construction of the transcontinental railroad. 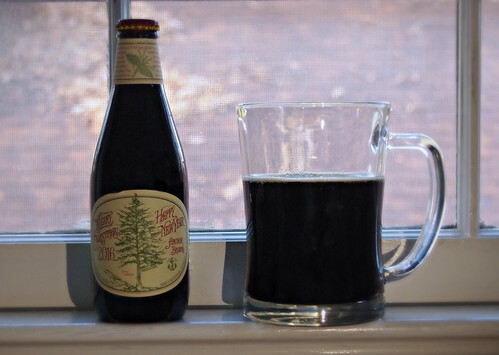 There was a time, not too long ago —but older than the birthdates of Millenial drinkers— that a beer fancier could find no Christmas beers stacked on American store shelves or poured from bar taps. None. 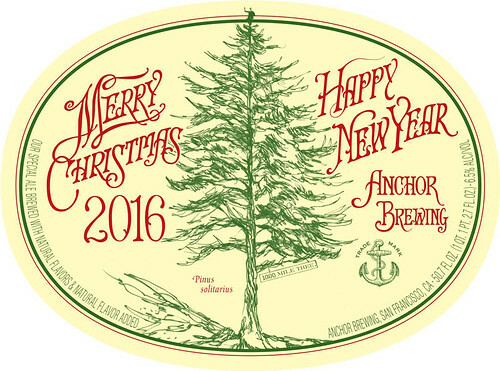 That is, until 1975, when Anchor Brewing —re-tooled only nine years earlier from a failing 19th-century San Francisco brewery into the first American 'craft' brewery— brewed the nation's first 'craft' Christmas beer. Owner Fritz Maytag named it "Our Special Ale" to molify the religious censors. Now, forty-two years on, Anchor is no longer alone; one can Christmas tipple in profusion. “I was aware of the tradition in medieval villages where they would make special beers for various festival days,” Maytag says. 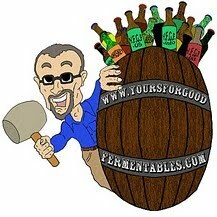 “You'd have beers brewed for weddings, festivals, and other celebrations. And certainly, you'd brew them for Christmas.” It made sense that a small brewery that had been revived thanks to old-world-beer-making techniques would rediscover the tradition of holiday beer. There was only one problem: Maytag didn't have a clue what it should taste like. To celebrate his wedding, Maytag crafted a bridal ale filled with herbs and spices. It was so tasty, that the brewery decided to add spices to its [brown ale] holiday ale that winter —and has done so ever since. There's a different recipe each season, and neither Maytag nor any of his employees have ever revealed what's behind those mysterious flavors. No! That's the only thing I'm going to say. There are no cloves in it none. I'm tired of hearing about cloves! This year marks the 50th anniversary of the year Maytag bought, saved, and revived Anchor, thus ushering in the era of American 'craft' beer. In 2011, Maytag sold the brewery, but remains as "Chairman Emeritus," proud of each of the brewery's beers as "works of art." 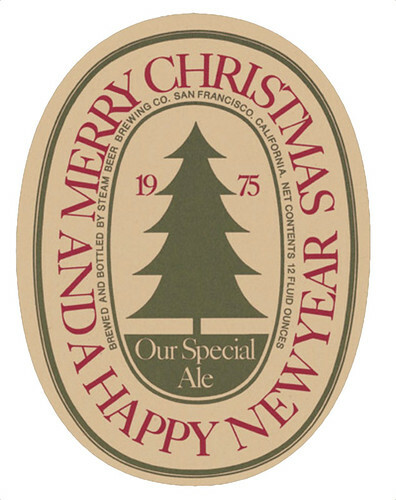 Each of the forty-two labels of "Our Special Ale" has featured a drawing of a tree, and each (except in 1976) was drawn by one artist, Jim Stitt. Stitt clearly based his label on the photo, though it’s hard to tell from Russell’s shot whether the man high atop the tree is holding onto a mug of beer. Probably not, but he is in Stitt’s rendering. The tree died in 1900 and was removed. But in 1982, Union Pacific planted a new one to commemorate the site, albeit now only about 960 miles from Omaha thanks to track changes over the years. Enclosed within a fence, the tree is in roughly the same spot, though it has a long way to go to match the original’s height. This winter-holiday season, beer writer Jay Brooks has run a forty-two part series at his blog Brookston Beer Bulletin, depicting each of the beer's labels, from the incarnation of "Our Special Ale" in 1975 to the present year. With his permission, I've collected all of them here in table format: each of the forty-two labels and its corresponding tree. Click on a thumbnail to view a larger image accompanied by a brief story of that year's creation. Anchor's "Our Special Ale" is but one beer, and by today's 'crafty' standards, fusty, even if 6.5% alcohol-by-volume. That is, until one tastes it, until one reflects on how it has been, and is, a seminal and delicious part of 'craft' beer's half-century history. Clamps & Gaskets: News Roundup for Weeks 49/50, 2016. "All human beings are born free and equal in dignity and rights." The 68th anniversary of Universal Declaration of Human Rights. [In the mid-1870s,] the U.S. population was roughly 45 million. So there was one brewery for roughly every 11,000 people. The U.S. population today is 325 million. That breaks down to one brewery per 65,000 people. If we had the same number of breweries per capita today that there were in the 1870s, there would be nearly 30,000 breweries in the country. 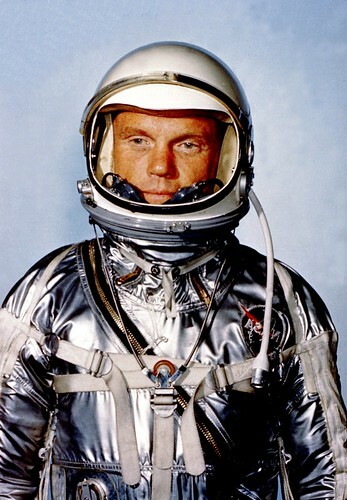 John Glenn, the first American to orbit the Earth, dies at 95. According to the U.S. National Center for Health Statistics, the overall U.S. death rate has increased for the first time in a decade, and that has led to a drop in overall life expectancy for the first time since 1993. On average, the overall life expectancy, for someone born in 2015, fell from 78.9 years to 78.8 years. The life expectancy for the average American man fell two-tenths of a year — from 76.5 to 76.3. For women, it dropped one-tenth — from 81.3 to 81.2 years. The overall death rate in 2015 increased from 724.6 per 100,000 people to 733.1 per 100,000. Without citing historical references, a 'craft' beer magazine accuses American brewers of turning to crime, en masse, during Prohibition. 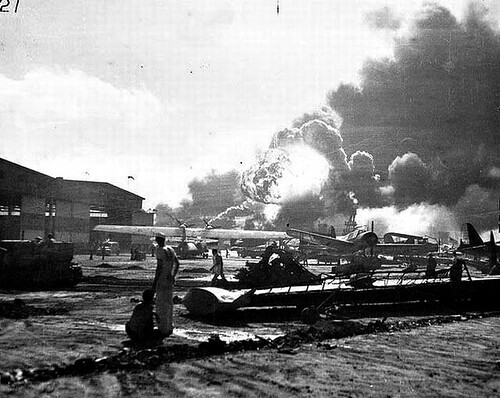 The 75th anniversary of the Imperial Japanese attack on the United States naval facities in Pearl Harbor, Hawaii. Sales of beer and wine on-the-premises were down slightly in 2016. However, dollar sales continued to increase "as consumers gravitated towards more premium spirits, wine, and beer products." Some breweries are doing [IBU] calculations rather than measurements; they’re calculating 120 IBUs in an IPA but they know, given solubility, that’s not even possible. I felt like as an industry we were lying to consumers, not overtly, but out of ignorance. —Kurt Driesner, quality assurance director at Urban Chestnut Brewing of St. Louis, Missouri, as quoted at DRAFT. As of the end of November, there were 5,005 active brewing companies in the United States, yet again a record number. Ninety-nine percent of them were 'craft' breweries, i.e., "small and independent." Summer is peak beer season, but more [beer] is sold in December than any other month. Americans bought more than $5.8 billion worth of beer, wine and liquor last December, about $1.3 billion more than July, the next highest-grossing month. 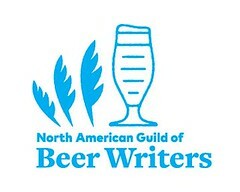 [...] The National Beer Wholesalers Association says craft beers sell better in winter than the traditional lagers and light beers most people drink during summer. The Army will not approve an easement necessary to permit the controversial Dakota Access Pipeline to cross under Lake Oahe in North Dakota, given that it would pass very near the reservation of the Standing Rock Sioux Tribe. The decision marked a victory for the Native American tribes and others who had protested onsite against the oil pipeline. Leaders of the Standing Rock Sioux Tribe expressed fears that a spill could threaten the water supplies of its people. Pic(k) of The Week: Happy Holidays?